The plankton larval duration for 100 species of Pacific and Atlantic damselfishes was estimated from daily growth increments on the otolith of juvenile fish collected at various localities between July 1987 and September 1988. For newly-settled fishes, larval duration was determined by counting the entire number of increments present on the otolith, while for older juveniles estimates were made by counting the number of increments between the center of the otolith and a mark corresponding to settlement. We document the development of otolith formation during the period when eggs are incubated on the reef and show that daily increments are only accreted after larvae hatch and enter the planktonic phase. 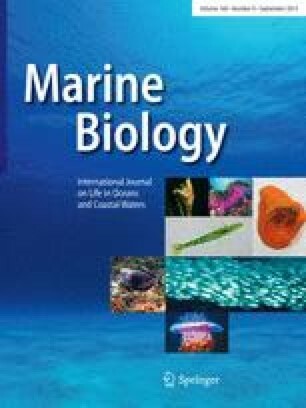 The planktonic larval duration for damselfish is shorter and less variable, both between and within species, compared to other groups of reef fishes such as wrasses and surgeonfishes. Larval duration ranged from 12 to 39 d. Average duration between species ranged from 13.1 to 35.2 d. The time spent in the plankton was not significantly correlated with geographic distribution when evaluated among species, however, genera with confined regional distribution have a shorter mean larval life than do widely distributed genera. Size at settlement was positively correlated with time spent in the plankton among species, but a significant correlation between these variables was only evident within one of ten species. The low variance in planktonic larval duration within species indicates that most damselfish are unable to delay metamorphosis following competency. This inability to postpone settlement limits the potential for dispersal, especially when dispersal time between suitable habitats is greater than about 30 d.